Newlyweds Lizzie and Kyle feature in today’s beautiful real wedding, set against the stunning backdrop of Saltmarshe Hall. With no specific theme in mind (a refreshing approach, if you ask us!) 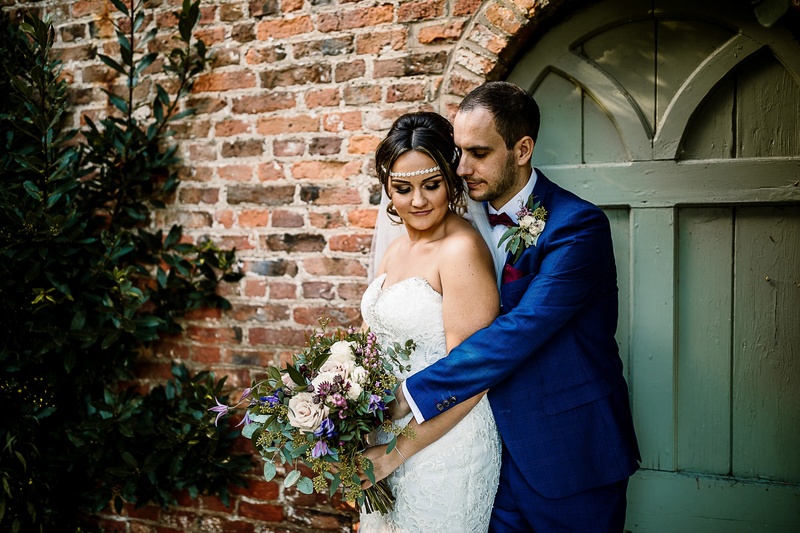 the couple developed different elements of their day – from the colour palette to the décor – along the way, which saw everything flawlessly falling into place. 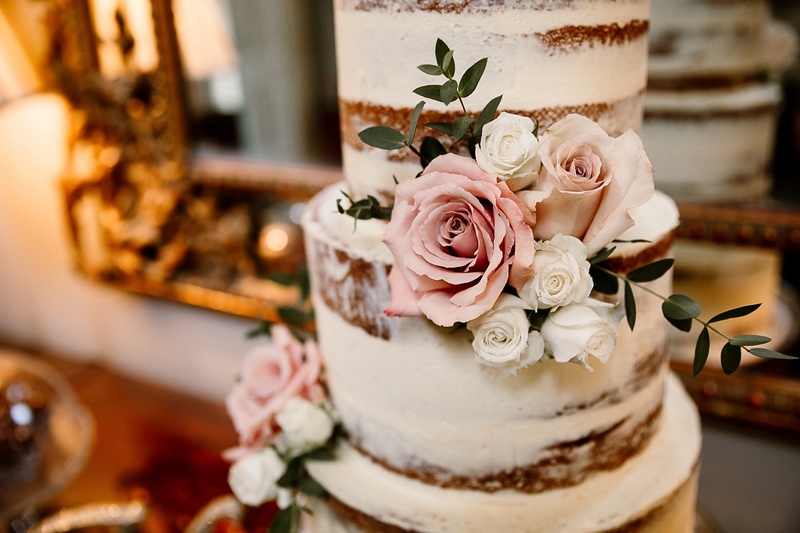 Plenty of exquisite touches compliment this decadent venue, with our personal highlights including the dreamy blossom trees, empty gin bottles filled with dainty fairy lights, and the handmade cake (made by the mother of the bride) adorned with offcuts from Lizzie’s stunning bouquet. Other novel ideas you might want to borrow for your own day include miniature gins for favours (very on trend at the moment), gift boxes to keep the children entertained and a surprise firework display for all the guests. Here’s Lizzie to fill us in on all the magical moments! With images by Hayley Baxter Photography. Lizzie says: Kyle popped the question on a random Wednesday evening in October 2016. It caught me totally off guard, which is what I had always wanted. I was totally shocked and not expecting it at all. We are not hugely romantic with gestures, so it was just perfect for it to be the two of us in our cosy little home. Our wedding date was 29th September 2018. 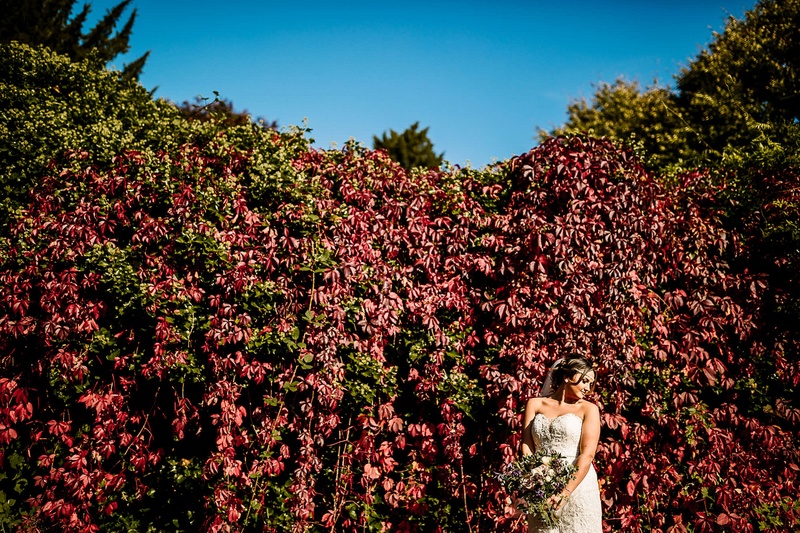 We wanted an autumnal wedding but always had hopes of a sunny day too. So, we took a risk with the end of September and it really paid off! 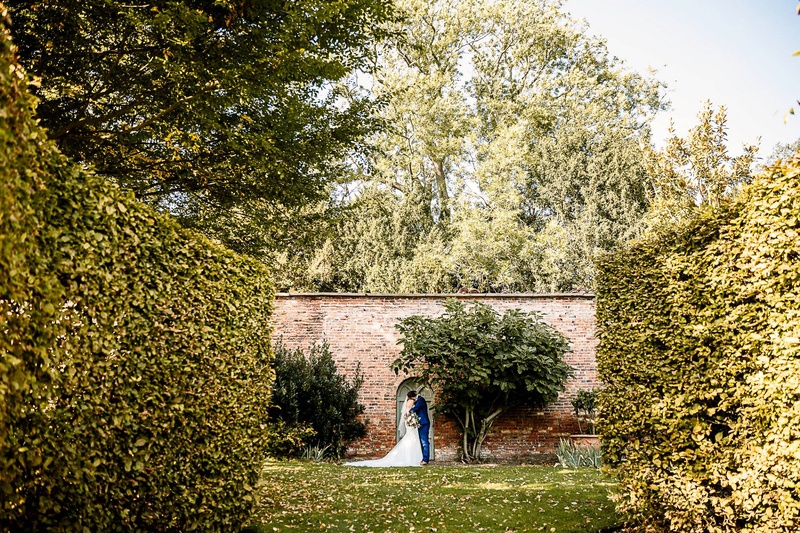 We chose to get married at Saltmarshe Hall in Howden, East Yorkshire. We had viewed three or four venues previous to this and nothing came close. 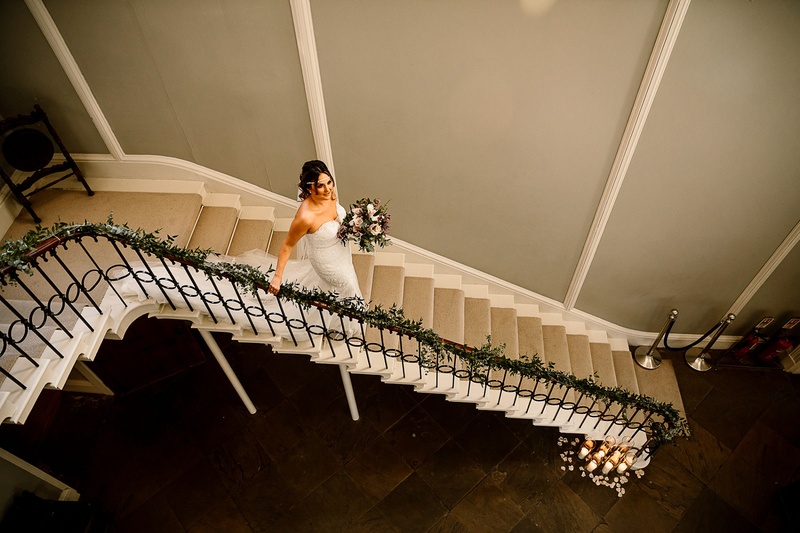 Firstly, we loved the venue itself and the beautiful surroundings. Secondly, we loved the fact that they give you complete freedom to customise your special day to the very last detail. It is so special to be able to personalise the little touches and really make it your own. There was no specific theme for our wedding. Everything was very personal, and we just decided on things along the way. We were very relaxed with our approach and just used the internet to get ideas and tweak them slightly to our taste.The table plan and favours were different types of gin. We also used empty gin bottles with fairy lights as decoration across the venue, which tied in nicely. We didn’t particularly have a wedding colour scheme either. I has a picture in my head of the bouquet that I wanted and once I had met with the florist, I just picked different colours from there for the rest of the wedding. The bridesmaids wore a dusky pink dress and the groomsmen had dark purple, which contrasted perfectly, and both went amazingly with the flowers. My dress was my absolute dream and my lovely mum kindly bought me it from Ava Rose Hamilton in Colne. The dress was a Stella York design from Essense of Australia. I always had an idea of the style that I wanted, or more so what to avoid for my figure! I tried on about five dresses before this one and as soon as I put it on – I just knew! It’s so true what people say about when you are trying on dresses. I personalised it with a beaded waist piece and headband to match. I loved the detailing of the bust and zip at the back. It was just so beautiful, and I loved wearing it. Kyle wore a three-piece suit from Joshua Adams with a deep purple dicky bow and pocket square. The groomsmen matched but with a tie rather than a dicky bow. 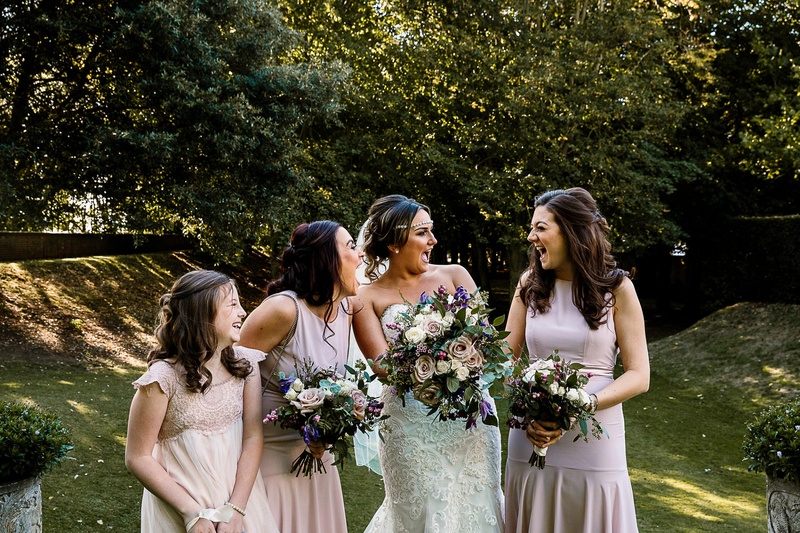 My bridesmaids wore dresses from Asos and they looked absolutely stunning. I had two flower girls; one was ten and the over was one. It was important to me that they matched so I found them some really cute dresses that complemented the bridesmaids, from Monsoon. They looked adorable. Our hair was left in the very capable hands of my lovely friend Jade and our makeup was done by MUA Megan Bulmer. The bridal prep in the morning was so much fun, we never stopped laughing. Our photographer was Hayley Baxter. What a woman! When looking for a photographer I found it quite difficult. Not knowing what you are paying for and who is best for the money? I contacted Hayley because she credits herself on being “relaxed, genuine and importantly unobtrusive”. This is exactly what we were looking for and she really did deliver that. Both Kyle and I admit that we are quite awkward at pictures, but you never even knew Hayley was there. This resulted in the most beautiful pictures we could have ever wished for. The flowers were provided by Flowers and Events by Cathryn. She is just so natural and good at what she does. I know very little about flowers so was a little overwhelmed by the prospect of picking the perfect ones. I did, however, have a picture in my head of what I would like, and Cathryn somehow created that perfectly. Cathryn also did the venue decorating and helped me to live out all the visions in my head by setting up all the finer details on the morning. 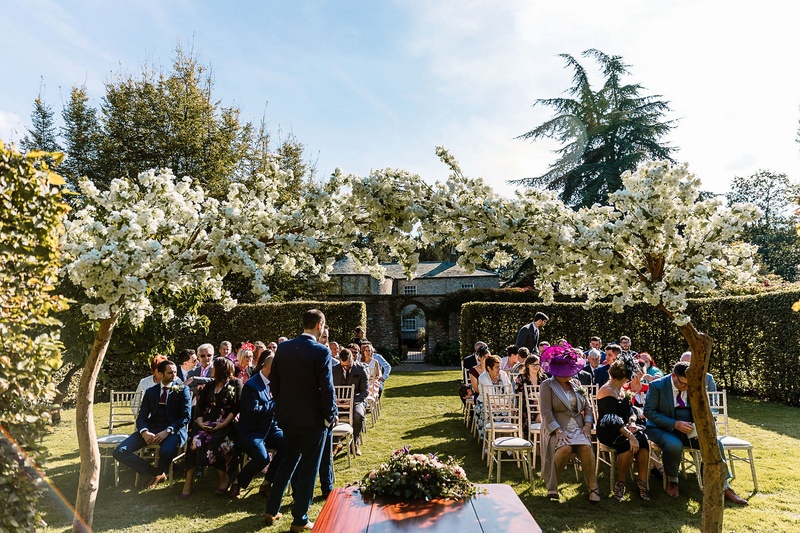 She completely exceeded all of my expectations and the love letters and blossom trees looked so stunning in the beautiful surroundings of Saltmarshe Hall. Our favours were little miniature versions of each gin featured in our table plan. We also had a “pimp my gin” station with different mixers and fruits so that guests could do just that. For the children I made little gift boxes with their names on, filled with little treats to keep them occupied. Luckily for us, my mum is an amazing baker and she kindly made our cake for us. She made a naked cake of three tiers, which were complemented by the off cuts from my bouquet. The flavours were milk chocolate and orange, passion fruit and lime and white chocolate and raspberry. To start, we had ploughman’s sharing boards for the tables, consisting of pork pie, pickles, cheeses and bread. It was perfect for people to help themselves to a little of what they fancied, and I found it relieved the stress of worrying too much about allergies and preferences for each course. For main it was chicken in red wine jus. And dessert was chocolate trash cheesecake. All of which I saw barely any of, because I was too busy loving life! We used Jonny Ross Music for our wedding entertainment. For our drinks reception we opted for a two-piece acoustic band who were fantastic. Once the evening came we had a full band called Something for the Weekend, who were amazing. I can’t recommend them enough. We had a surprise firework display for our guests which was provided by Rave Fireworks. It was such a great surprise and really got the evening off to a good start. I would highly recommend Saltmarshe Hall if you are after a picturesque venue with a really intimate feel. 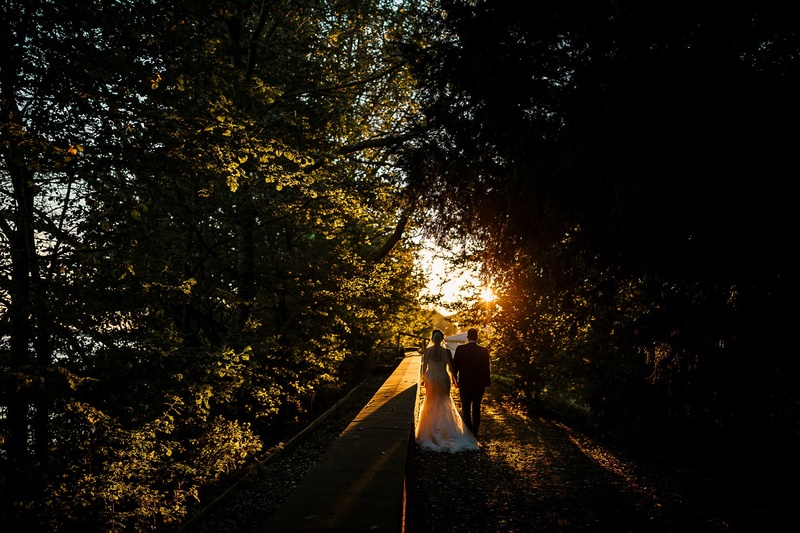 The staff allow you to personalise your special day to your heart’s content and the venue itself provides incredible photo opportunities. My favourite part of the day was, of course, marrying my husband Kyle. All the stress and lead up to the wedding goes out the window the second you see your partner waiting for you at the end of the aisle. The full day was just a dream come true to us both. We chose an American road trip for our honeymoon, starting in Vegas and then heading to the west coast in a convertible. We experienced so much in those two weeks and it was all just so surreal to see it all. We stopped in a total of nine places seeing the likes of San Diego, LA, Malibu, Sonoma and ending in San Francisco. We really did live the American dream. It’s easy to say now, but my top tip for other Brides Up North would be: try not to let the stress get to you. Trust me – you will look back and wish you could relive that stress just to do it all over again. A big bit of advice that people gave me was to consciously take it all in. Of course, I didn’t, because the day just took over, but if you can, try to! I regret not stepping back with Kyle and appreciating it all at the time. The bride absolutely looked stunning.